The Montana Nymph was introduced to Britain from the US in the mid 1950's. The original had a yellow thorax and was so successful that other colours were tried and the Green version became the most popular in the UK. In this selection you have all the colour variations in weighted and bead head versions. 22 flies in 8 patterns. 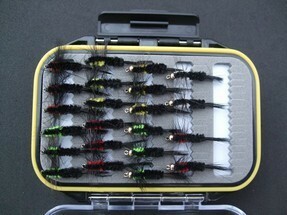 Looking to buy some Turrall Fly Selections as part of a fishing gift? If you would like some advice on purchasing Turrall Fly Selections, simply contact our expert fishing team, giving us either an email or phone number on which to contact you and we'll get back to you right away with the best advice and prices. FREE Delivery on all Turrall Turrall Fly Selections over £100!! !